The Hwasong-12 is a single-staged, liquid-fueled intermediate-range ballistic missile produced by North Korea. It was successfully test launched for the first time on May 14, 2017. The Hwasong-12 first appeared in North Korea’s “Day of the Sun” parade on April 15, 2017. It was speculated at the time that it could be a shortened version of North Korea’s untested KN-08 ICBM. The missile was carried on a vehicle previously associated with the BM-25 Musudan IRBM. 1 Evidence from the missile’s first test launch on May 15, however, indicates a single-stage design. North Korea has flight tested the Hwasong-12 at least six times, achieving three successful flights and three failures. September 14, 2017 1 Flight time: 19 min; distance traveled: 3,700 km; apogee: 770 km. August 28, 2017 1 Flight time: 14 min; distance traveled: 2,700 km; apogee: 550 km. May 14, 2017 1 Flight time: 30 min; distance traveled: 787 km; apogee: 2,111 km. April 29, 2017 1 Flight time: 15 min; distance traveled: 35 km; apogee: 71 km; broke up during flight. April 16, 2017 1 Exploded seconds after launch. April 5, 2017 1 Flight time: 9 min; distance traveled: 60 km; apogee: 189 km; reportedly “pinwheeled” out of control. The first successful Hwasong-12 test occurred on May 15, 2017 from a location near the the city of Kusong at 04:58 local time on May 14, 2017. 6 During the test, the missile was transported on a what appeared to be Musudan transporter-erector launcher (TEL). Rather than directly fired from the TEL, however, it was placed onto a platform for the launch. 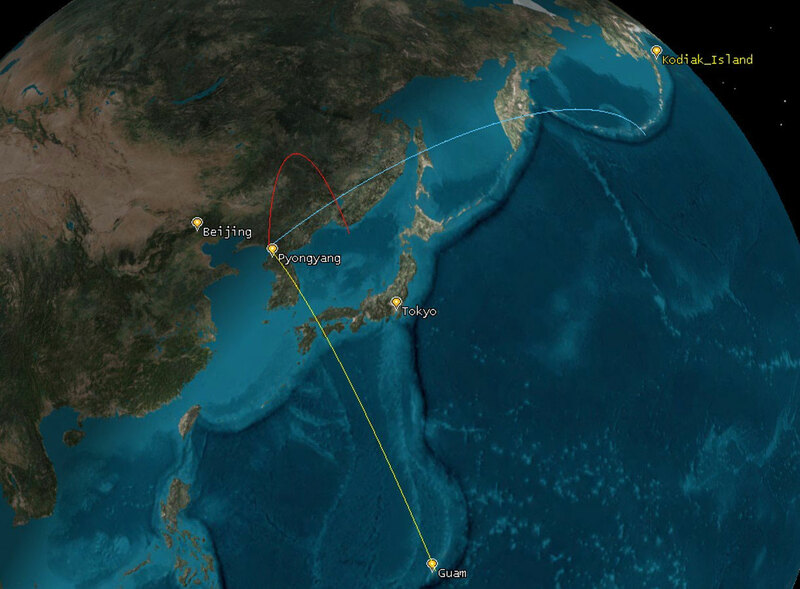 The red line indicates the lofted flight path of the Hwasong-12 flight test on May 14, 2017. The blue and yellow lines indicate other possible flight paths at range-maximizing ballistic trajectories. Image: Todd Harrison, Thomas Roberts, CSIS Aerospace Security Project. On September 15, North Korea carried out its sixth (third successful) Hwasong-12 test, again flying the missile over the northern Japanese island of Hokkaido. Launched from Sunan just north of Pyongyang, the missile flew for 19 minutes, traveling 3,700 km, reaching an altitude of 770 km, and landing 2,200 km off the east coast of Japan in the Pacific Ocean. Unlike previous tests, the missile was fired directly from a TEL, rather than from a concrete platform. This could indicate North Korea’s growing confidence in the Hwasong-12’s reliability. According to the Korean Central News Agency, the Hwasong-12 is “capable of carrying a large-size heavy nuclear warhead.” 12 The motor demonstrated in the Hwasong-12’s May 14 flight test could represent the first stage of a longer-range ICBM design. The Hwasong-12 was first speculated to be a modification of the North Korea’s KN-08 ICBM. The characteristics of the Hwasong-12 gleaned from the May 14 test, such as engine type and launch apparatus, now suggest that it may be different line of design entirely. It has been reported that the Hwasong-12 has also been designated by the U.S. government as the KN-17. 13 The KN-17 was initially thought to be a newer North Korean Scud variant equipped with a maneuvering reentry vehicle. The 2017 NASIC report on ballistic and cruise missiles, however, noted that the Hwasong-12 testing began in April, confirming that KN-17 does refer to the Hwasong-12. Missile Defense Project, "Hwasong-12," Missile Threat, Center for Strategic and International Studies, May 16, 2017, last modified June 15, 2018, https://missilethreat.csis.org/missile/hwasong-12/. Ian Williams & Thomas Karako, “North Koreas New Missiles on Parade,” CSIS Commentary, April 18, 2017, https://www.csis.org/analysis/north-koreas-new-missiles-parade. “North Korea test-fires missile into sea ahead of Trump-Xi Summit,” Ju-min Park and Jack Kim, Reuters, April 5, 2017, http://www.reuters.com/article/us-northkorea-missiles-idUSKBN1762XX. “Pentagon Announces Review of Nuclear Posture amid North Korea Tensions,” Lucas Tomlinson, Fox News, April 17, 2017, http://www.foxnews.com/politics/2017/04/17/pentagon-announces-review-nuclear-posture-amid-north-korea-tensions.html. “North Korea’s Missile Test Fails, US Military Says,” Ryan Browne, CNN, April 29, 2017, http://www.cnn.com/2017/04/28/world/north-korea-missile-launch/. Choe Sang-Hun, “North Korea Launches a Missile, Its First Test After an Election in the South,” The New York Times, May 13, 2017, https://www.nytimes.com/2017/05/13/world/asia/north-korea-missile-test-kim-jong-un-moon-jae-in.html?_r=0. Todd Harrison, Twitter Post, March 15, 2017, https://twitter.com/ToddHarrisonDC/status/864178196429905920. Ralph Savelsberg, “A Quick Technical Analysis of the Hwasong-12,” 38 North, May 19, 2017, http://38north.org/2017/05/hwasong051917/. Anna Fifield, “North Korean missile flies over Japan escalating tensions and prompting an angry response from Tokyo,” Washington Post, August 28, 2017, https://www.washingtonpost.com/world/north-korean-missile-flies-over-japan-escalating-tensions-and-prompting-an-angry-response-from-tokyo/2017/08/28/e1975804-8c37-11e7-9c53-6a169beb0953_story.html?tid=a_inl&utm_term=.717df0e1fc3e. Jeffrey Lewis & Scott Lafoy, “The Hwasong 12, finally,” Arms Control Wonk Podcast, May 15, 2017. CSIS Missile Defense Project, “KN-08/Hwasong 13,” Missile Threat, August 8, 2016, https://missilethreat.csis.org/missile/kn-08/. “Kim Jong Un Guides Test-Fire of New Rocket,” Korean Central News Agency, May 15, 2017. Ankit Panda, “Exclusive: North Korea Tested Its New Intermediate-Range Ballistic Missile 3 Times in April 2017,” June 3, 2017, http://thediplomat.com/2017/06/exclusive-north-korea-tested-its-new-intermediate-range-ballistic-missile-3-times-in-april-2017/.